The perfect set for your Asian Food!!!! you and your beloved ones are going to feel like having dinner at a traditional restaurant, and your recipes will shine!!! Can I use them in the microwave? Feel like a Professional chef with this set. Click "Add to Cart" right now and Order Yours Today!!! IMPORTANT: you will receive your ebook by mail 3 days after you get your items!!! 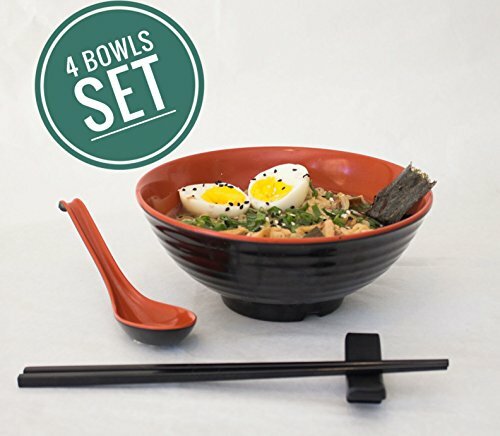 ✔️ SPOONS, CHOPSTICKS, AND CHOPSTICK stand INCLUDED: Each set comes with everything you need. Complete tableware to serve your family and guests with. And unlike other listings, we include chopstick stands, which is much more hygienic and avoid messing the tablecloth. ✔️ LIFETIME WARRANTY: Love them or we 'll buy them back from you, no questions asked! If you have any questions about this product by Vallenwood, contact us by completing and submitting the form below. If you are looking for a specif part number, please include it with your message.